The enormous Romanesque Bibles stand testament to the power and wealth of the great monastic houses for which they were produced, as well as to the central importance of scripture to the lives of the monks. Large volumes, like modern lectern Bibles, enabled easy reading in the communal setting of mealtimes, teaching and the liturgy. These copies were made in abbeys all over Europe, as demonstrated by the French, German, and Mosan monastic Bibles in this section. Images were used in these large monastic Bibles as well as in other biblical texts to illustrate, explain, or decorate the scriptures. For example, in the Harley Psalter, a copy of a remarkable Carolingian manuscript, the extensive illustration translates the Psalms virtually phrase-by phrase into visual form. 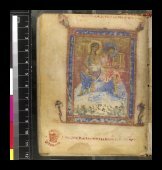 Alternatively, prefatory images from the Life of Christ came to be included before copies of the Psalms, as in the Tiberius Psalter and the Psalter of Henry the Lion. Such images demonstrate the Christian interpretation of this book as foreshadowing the coming of the Messiah. Textual glosses are also often included, appearing around the scriptural text, as in the glossed copy of the Psalms from England or France. Many of these copies of the Psalms appear to have been used in private devotions—in the Shaftesbury Psalter the image of a kneeling woman may represent the owner who commissioned the book. Although never so popular as the Gospels, Psalms, or Epistles, the book of Revelation, or Apocalypse, also appeared in separate volumes, each time prompted by a particular interest in its distinctive and apocalyptic vision of the future, as in the Silos Apocalypse, made at the abbey of Santo Domingo de Silos in northern Spain. Like several other individual books of the Bible, its text was most often copied in conjunction with and in the same volume as a commentary explaining it. Canon table, in Latin, The Bury Gospels, Canterbury or Bury St Edmunds, England, 1st half of 11th century, 265 x 200 mm. Psalm 15 (14), in Latin, The Harley Psalter, Canterbury, England, 1st half of 11th century (with later additions), 380 x 310 mm. Adam naming the animals Genesis, in Old English, The Old English Hexateuch, Canterbury, England, 1st half of 11th century, 330 x 220 mm. Nativity, Four Gospels, Echternach, near Trier, Germany, middle or 3rd quarter of 11th century, 235 x 170 mm. The Dragon (Serpent) and the Woman of the Sun, The Silos Apocalypse, Silos, Spain, 1091 (text) and 1109 (decoration), 380 x 240 mm. Evangelist portrait of Mark, Cologne Gospels, Cologne, Germany, last quarter of 11th century, 280 x 205 mm. David harping, The Mar Saba Psalter, Jerusalem, circa 1090, 120 x 95 mm. Elimelech, Naomi, and their sons, Ruth, in Latin, Montpellier Bible, Southern France, 1st quarter of 12th century, 510 x 370 mm. David and Christ, Psalm 1, in Latin, Glossed Psalter, Southern England or northern France, middle of 12th century, 260 x 175 mm. Psalm 74 (73), in Latin, Monte Cassino Psalter, Southern Italy, middle of 12th century, 200 x 130 mm. 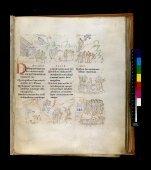 Presentation, Moses and Malachi, The Psalter of Henry the Lion, Helmarshausen, Germany between 1168 and 1189, 210 x 130 mm. Virgin and Child, The Shaftesbury Psalter, Dorset ?, England, 2nd quarter of 12th century, 220 x 130 mm. Crucifixion, a sacrifice, Luke, in Latin, The Floreffe Bible, Meuse valley, southern Netherlands, middle or 3rd quarter of 12th century, 475 x 330 mm.